The Sweepstakes has ended. Take a look at the gallery to get another glimpse of all the cute babies! Get your Personal Referral Links. Simply enter your email address. Same amazing yobaby, fresh new look. Sponsor. The Thanks, Dad Sweepstakes (the "Sweepstakes") is sponsored by Stonyfield Farm, Inc., 10 Burton Drive, Londonderry, NH ("Sponsor" or "Stonyfield"). Eligibility. Open only to legal residents of the United States (excluding Alaska, Hawaii, Puerto Rico, and all other U.S. territories and possessions outside of the United States and where otherwise prohibited by law) who (i) are 18 years of age or older at the time of entry in the Sweepstakes (or in the case of legal residents of jurisdictions where the age of majority is greater than 18 years of age, such age of majority under the laws of the jurisdiction in which they reside at the time of entry) and (ii) have a smartphone or other device with Internet service and photography capabilities. Employees, officers, directors, agents, representatives and independent contractors (and their immediate family members and members of the same households (whether related or not) of Sponsor or its parent, subsidiaries and affiliated companies, are not eligible to participate. Subject to all federal, state and local laws and regulations. Void in Alaska, Hawaii, Puerto Rico, and all other U.S. territories and possessions outside of the United States and where prohibited by law or restricted by such laws, including but not limited to jurisdictions with laws that would require registration and/or trust account or posting of a bond, or any other requirements that have not been satisfied. Open only to legal residents of the United States (excluding Alaska, Hawaii, Puerto Rico, and all other U.S. territories and possessions outside of the United States and where otherwise prohibited by law) who (i) are 18 years of age or older at the time of entry in the Sweepstakes (or in the case of legal residents of jurisdictions where the age of majority is greater than 18 years of age, such age of majority under the laws of the jurisdiction in which they reside at the time of entry) and (ii) have a smartphone or other device with Internet service and photography capabilities. Employees, officers, directors, agents, representatives and independent contractors (and their immediate family members and members of the same households (whether related or not) of Sponsor or its parent, subsidiaries and affiliated companies, are not eligible to participate. Subject to all federal, state and local laws and regulations. Void in Alaska, Hawaii, Puerto Rico, and all other U.S. territories and possessions outside of the United States and where prohibited by law or restricted by such laws, including but not limited to jurisdictions with laws that would require registration and/or trust account or posting of a bond, or any other requirements that have not been satisfied. Application of Rules. All entrants must review and agree to these Official Rules. By entering the Sweepstakes, each entrant warrants that he/she has read and agrees to abide and be bound by these Official Rules and that he/she is not prohibited from participating in the Sweepstakes. Submission of an entry automatically constitutes entrant’s agreement to be bound by these Official Rules. Entrants further agree that Sponsor shall retain full authority, in its sole discretion, to interpret and administer these Official Rules, and to be bound by all decisions and interpretations made in good faith by Sponsor. Sweepstakes Entry. The Sweepstakes begins at 12:00 a.m. Eastern Standard Time (EST) on May 21, 2018 and ends at 11:59 p.m. (EST) on June 17, 2018 (the "Sweepstakes Period"). Entry is free, and no purchase or payment of any kind is necessary to enter or win the Sweepstakes. Limited to only one (1) entry per entrant per Week (as defined below) during the Sweepstakes Period. For the purposes of this Sweepstakes, a week runs from Monday, 12:00 a.m. EST to Sunday, 11:59 p.m. EST (“Week”). Entries received in excess of the above stated limitation will be void. NO PURCHASE OR PAYMENT NECESSARY TO ENTER OR TO WIN. A PURCHASE WILL NOT INCREASE YOUR CHANCES OF WINNING. VOID WHERE PROHIBITED BY LAW. To enter, visit the Sweepstakes website, https://www.stonyfield.com/thanksdad ("Sweepstakes Website") during the Sweepstakes Period. Navigate to the Sweepstakes entry page, (i) complete the entry form, including your full name, e-mail address, zip code, and the first name and birth month and year of the minor child(ren) who appear in the Photo (as defined below) uploaded with your entry; (ii) confirm that you are 18 years of age or older at the time of entry in the Sweepstakes (or in the case you reside in a jurisdiction where the age of majority is greater than 18 years of age such age of majority under the laws of that jurisdiction); and (iii) upload a Photo (as defined below) compliant with the requirements set forth in these Official Rules. All required elements of an entry must be submitted at the same time. Entrants may also opt in to receive Sponsor’s newsletter, but are not required to in order to enter the Sweepstakes. Materials submitted to Sponsor by entrant shall not contain any protection feature designed to prevent its use, or any computer virus or other similar programs. Entrants acknowledge and agree that their respective entries become the property of Sponsor, subject to these Official Rules, and will not be returned. Upon submission of an entry, entrant will receive a pop-up notice, with a unique link to provide to other potential entrants. Entrant will receive one (1) additional entry into the Sweepstakes drawing if (i) entrant’s Photo is posted to the Sweepstakes Website, (ii) the unique link is utilized by a separate entrant to enter the Sweepstakes, and (iii) such separate entrant’s entry is also posted to the Sweepstakes Website. Limited to twenty (20) additional entries into the Sweepstakes drawing through this method during the Sweepstakes Period, which entries shall be associated with the entrant’s Photo originally posted to the Sweepstakes Website per (i) above. 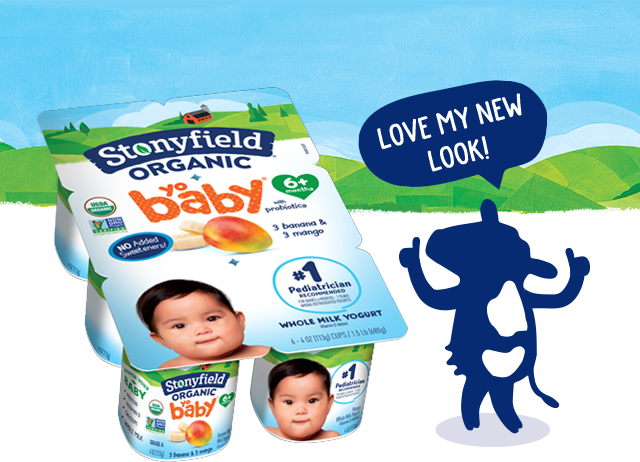 Entrant will also receive, upon submission of an entry, an e-mail confirming the submission of the entrant’s entry and providing a Stonyfield coupon. All entries may be reviewed prior to posting on the Sweepstakes Website. Posting to the Sweepstakes Website does not constitute verification of eligibility and/or compliance with Official Rules. Entrant will receive an additional email advising entrant whether his/her entry was posted to the Sweepstakes Website. If the entry is posted to the Sweepstakes Website, such email will include a direct link to the entrant’s entry on the Sweepstakes Website. An entry must be received by Sponsor within the Sweepstakes Period. If there is a dispute over the identity of an entrant, the entry will be deemed submitted by the Authorized Account Holder regardless of the individual that submitted the entry. "Authorized Account Holder" is defined as the natural person who is assigned an e- mail address by an Internet access provider, online service provider or other organization (e.g., business, educational, institution, etc.) responsible for assigning e-mail addresses for the domain associated with the e- mail address submitted with the entry. The potential winner may be required to show proof of being the Authorized Account Holder. Entries that have been generated by a script, macro, bot or any other automated means will be deemed void. Entrants may not register with multiple e-mail addresses nor may entrants use multiple devices or artifices to enter the Sweepstakes as multiple entrants. Any entrant who attempts to enter with multiple accounts under multiple identities will be disqualified in Sponsor's discretion. Proof of submission of an entry shall not be deemed proof of receipt by the Sponsor. Neither Sponsor nor its service providers are responsible for lost, late, incomplete, illegible, mutilated, inaccurate, or misdirected entries, or for any problems of any kind whether mechanical, human or electronic, including, but not limited to, computer, telephone, cable, network, satellite, electronic or Internet hardware or software malfunctions, failures, connections, availability or garbled or jumbled transmissions, or service provider/Internet/web site/use net accessibility or availability, traffic congestion, or unauthorized human intervention. Sponsor reserves the right to suspend or terminate the Sweepstakes in the event of any such problem. Entries not in compliance with these Official Rules will be disqualified. Sponsor shall have the absolute right to determine if an entry is in compliance with these Official Rules without notice to the person attempting to enter. Entrants understand and acknowledge that their respective entry(ies) Photo(s) may receive exposure on the Internet and may be subjected to comments from the public at large. Sponsor is not responsible for any remarks, including any critical or derogatory remarks, posted by the public pertaining to an entrant or an entrant’s entry Photo. The Photo must include a child or children between the ages of six (6) to twenty-four (24) months and of whom the entrant is a custodial parent or legal guardian. The content of the Photo must include a father, grandfather, uncle or other father figure interacting with the child or children in the photo. The child must be appropriately clothed and must, at the least, be wearing a diaper. The Photo must be an original creation. Modifying, enhancing or altering a third party's preexisting work does not qualify as an original creation. Each entrant must be the owner of the Photo submitted with the entry, including the copyright therein, or must have all of the rights and authority necessary to submit it with his/her entry, including without limitation the right to publish the Photo and to grant the rights granted hereunder. The entry Photo may not contain any animals, nor any mention, discussion, logo, company name, products, trademark, service mark, storefront, trade dress, mascot, photograph, or other image of any business or company, except for Sponsor's and/or its brands. The Photo may not include any property names or physically identify a property by photographing their front sign or any other unique identifying feature or distinguishable architecture. BY SUBMITTING THE PHOTO WITH HIS/HER ENTRY, ENTRANT CERTIFIES THAT HE/SHE HAS THE RIGHT TO CONTRACT IN HIS/HER OWN NAME AND FOR THE CHILD(REN) APPEARING IN THE PHOTO SUBMITTED AS PART OF THE ENTRY. SPECIFICALLY, BY SUBMITTING THE PHOTO ENTRANT REPRESENTS AND WARRANTS THAT HE/SHE IS A CUSTODIAL PARENT OR LEGAL GUARDIAN OF SUCH CHILD(REN) AND HAS THE LEGAL RIGHT TO CONSENT TO AND DOES CONSENT TO THE USE OF THE PHOTO AS DESCRIBED IN THESE OFFICIAL RULES. THE ENTRIES REPRESENT SOLELY THE VIEWS/OPINIONS OF THE INDIVIDUAL ENTRANT AND DO NOT REFLECT THE VIEWS/OPINIONS OF SPONSOR IN ANY MANNER. SPONSOR IS ACTING AS A PASSIVE CONDUIT FOR THE POSTING/PUBLICATION OF ENTRIES AND HAS NO OBLIGATION TO AND EXPRESSLY DISCLAIMS ANY AND ALL LIABILITY IN CONJUNCTION WITH SCREENING, MONITORING OR REVIEWING THE CONTENT OF ENTRIES. SPONSOR WILL NOT EDIT ENTRIES SUBMITTED BY ENTRANTS PRIOR TO THEIR POSTING BUT MAY NOT POST THEM IF DEEMED NONCOMPLIANT WITH THESE OFFICIAL RULES. The entry Photo posted to enter the Sweepstakes must be in keeping with the Sponsor's positive image, must be suitable for online publication accessible to the general public, and may not be offensive or inappropriate, as determined by Sponsor in its sole discretion, nor can it defame or invade publicity or privacy rights of any person or entity, or otherwise contravene or infringe upon the intellectual property rights, moral rights,property rights or any other rights of third parties. Sponsor reserves the right to eliminate and not post any entries that it determines, in its sole discretion, contain inappropriate content or content that may be deem obscene, defamatory, libelous, threatening, pornographic, harassing, hateful, racially or ethnically offensive, or unlawful, including, without limitation, obscenities, threats, violence, unsafe behavior or situations, or disparagement of any product, service or person. In addition to complying with the foregoing requirements, to be eligible, each entrant must also be able to make the warranties and representations regarding the Photo submitted with his/her entry, set forth in the Warranties and Representations section below. Warranties and Representations. By submitting an entry, including the Photo submitted with it, each entrant warrants and represents to Sponsor that (a) the information contained in the entry is true and correct in all material respects and that Sponsor may rely on such information in its efforts to comply with applicable laws and regulations; (b) entrant is the custodial parent or legal guardian of the child(ren) appearing in the Photo submitted as part of the entry (“Entrant’s Child(ren)”); (c) any third party appearing on the Photo (other than Entrant's Child(ren)) have given entrant appropriate consent to submit the Photo for entry in the Sweepstakes in compliance with these Official Rules; (d) entrant has all of the rights and authority necessary to submit the Photo for entry in the Sweepstakes in compliance with these Official Rules, including the right to contract in his/her own name and for the child(ren) appearing on the Photo, the right to publish the Photo, and the right to grant the rights granted hereunder; (e) that the Photo and the above-mentioned rights are in all respect free and clear of any claims or rights of third parties; (f) that the Photo is an original work and has not been published; (g) that at the time of submitting the entry or any time thereafter, the entry does not contravene any contractual, legal or other obligation; (h) that at the time of submitting the entry or any time thereafter, the entry does not infringe the intellectual property rights of any third party; (i) that the Photo contains no matter contrary to law; (j) that entrant has not made any commitment for the use or publication of the Photo; (k) that the Photo and its publication do not and will not violate any privacy, publicity or other intellectual property, personal or proprietary rights of any person or entity; and (l) that the Photo does not incorporate/display or refer to third party trademarks, company names, products or logos except for Sponsor's and/or its brands. Sponsor reserves the right to request releases from any third party appearing in the Photo. Failure to produce third-party releases upon Sponsor’s request may result in disqualification, as determined by Sponsor in its sole and absolute discretion. BY SUBMITTING AN ENTRY, EACH ENTRANT CONSENTS TO THE POSTING OF THE PHOTO ON THE SWEEPSTAKES WEB SITE LOCATED AT https://www.stonyfield.com/thanksdad, SPONSOR'S WEBSITE WWW.STONYFIELD.COM AND AT SPONSOR'S FACEBOOK, TWITTER AND INSTAGRAM SITES CURRENTLY LOCATED AT WWW.FACEBOOK.COM/STONYFIELD, WWW.TWITTER.COM/STONYFIELD, AND/OR WWW.INSTAGRAM.COM/STONYFIELD, ALONG WITH ENTRANT'S FIRST NAME AND STATE OF LEGAL RESIDENCE AND THE FIRST NAME OF THE CHILD(REN) APPEARING IN THE PHOTO, ALL OF WHICH WILL BE AVAILABLE TO AND MAY BE VIEWED BY THE PUBLIC AT LARGE. Selection of Winner. The winner will be selected at random by Sponsor, whose decision will be final and binding, from all eligible entries within two (2) business days after the Sweepstakes Period ends. Odds of winning depend on the number of eligible entries. In the event a winning entry is discovered to be invalid for any reason whatsoever or the entrant either fails to comply with these Official Rules prior to delivery of the prize or refuses the prize or any portion thereof, the prize may be forfeited and awarded to an alternate winner selected at random from the remaining eligible entries at Sponsor’s discretion. An alternate winner will be selected at random from the remaining eligible entries until the prize has been awarded. Notice/Verification of Potential Winner. The potential winner must continue to comply with all terms and conditions of these Official Rules, and winning is contingent upon fulfilling all requirements and verification by Sponsor of eligibility. Sponsor will attempt to notify the entrant who is selected as a potential winner by e- mail within three (3) business days of their respective selection. If an entrant does not respond to such notification within two (2) business days or cannot or refuses to accept the prize, the prize will be forfeited and an alternate potential winner will be selected at random from the remaining eligible entries. Sponsor shall not be responsible for (i) the failure of a potential winner to receive Sponsor's e-mail for any reason, or for the inability of such potential winner to return Sponsor's e-mail message for any reason; (ii) failed, returned or misdirected notifications due to inaccurate information provided by entrant; (iii) submissions and responses to a winner’s notification which are lost, late, incomplete, illegible, unintelligible, misdirected, damaged or otherwise not received, in whole or in part, by Sponsor. Sponsor reserves the right to require the potential winner to show proof of identity prior to receiving a prize. The potential winner will be required to complete an Affidavit of Eligibility and Release and Photo License granting Sponsor a license to use the potential winner's Photo consistent with these Official Rules and such other documents as Sponsor may reasonably require, and return these documents within five (5) business days of delivery. If these documents are returned as undeliverable or are not completed and returned by such deadline or if a potential winner does not meet the eligibility or other requirements of the Sweepstakes, the prize will be forfeited and an alternate winner will be selected at random from the remaining eligible entries. If the prize notification and/or other prize-related information or materials are returned as undeliverable, or any prize documentation is not submitted as required by Sponsor, the corresponding prize will be forfeited and an alternate potential winner will be selected at random from the remaining eligible entries. The prize will be delivered within ninety (90) days of Sponsor’s receipt of the documents required by Sponsor to be completed and signed by the potential winner. Sponsor shall not be responsible for delivery of any documents and/or the prize or prize-related materials and information provided that Sponsor addresses the documents to the address provided by the potential winner. Sponsor is not responsible for prize information or documents that are lost or misdelivered by the postal service or carrier. Prize. The winner will receive $10,000.00, in the form of a check made out to the winner, which can (but is not required) to be used toward the child(ren)'s college education of the child(ren) appearing on the Photo submitted with the winning entry. The cash value of the prize is $10,000.00. Specifics relating to the prize not specified herein are at sole discretion of Sponsor. The winner is solely responsible for any costs and expenses due in connection with their prize not specified herein. The prize may not be transferred or assigned, except at the Sponsor's sole discretion. No substitution of the prize will be permitted or provided, except that Sponsor, in its sole discretion, may provide a prize of comparable or greater value. Sponsor will not replace a lost or stolen prize. The winner is solely responsible for reporting and paying any and all applicable federal, state and local taxes due in connection with the respective prize. The winner will be required to complete and submit an IRS Form W-9 for receipt of any prize valued at $600 or more. Failure to submit a complete IRS Form W-9 when required will result in forfeiture of the prize. Receipt of any prize is conditioned upon compliance with all applicable federal, state and local laws, rules and regulations and these Official Rules. Use of Photos. The copyright in the Photo submitted as part of a entrant’s entry shall remain his/her property, but entry into the Sweepstakes constitutes entrant’s agreement, if declared the winner, to grant Sponsor irrevocable and perpetual permission, consent and the exclusive right and license, without further compensation, to use, reproduce, print, publish, transmit, distribute, sell, perform, adapt, resize, enhance, display and make derivative works of, such Photo, individually or in conjunction with other material and/or copyrighted matter, for any lawful purpose, including but not limited to editorial, advertising, trade, commercial, and publicity purposes by Sponsor and/or others authorized by the Sponsor, in any and all media now in existence or hereinafter created, throughout the world, for the duration of the copyright in the Photo, except where prohibited by law. The winner further understands and agrees that Sponsor shall have the absolute right, to refrain from or stop using the winner's Photo, if Sponsor, in its sole discretion, determines at any time that the winner has committed any act or pursued any course of conduct that is not in keeping with the Sponsor's positive image, that would tend to bring Sponsor and/or any of its products into disrepute and/or that likely would damage or otherwise be detrimental to the reputation and goodwill associated with Sponsor. Non-winning entrants agree that they may be contacted by Sponsor through e-mail in order to seek permission from them to use the Photo separate from the Sweepstakes. Suspension and Amendments. Sponsor reserves the right to (i) suspend, modify or cancel this Sweepstakes, at any time in its sole discretion, if the Sweepstakes cannot be operated as planned or in the event any computer virus, worm, bug, tampering, unauthorized intervention, fraud, technical failures or other errors or problems beyond Sponsor’s control should corrupt or affect the administration, security, fairness, integrity or proper conduct of the Sweepstakes, or for any other reason and, if this Sweepstakes is cancelled, to select a winner from among the eligible entries in the Sweepstakes drawing prior to the cancellation date or to re-commence the Sweepstakes, at such time(s) and upon such terms and conditions as Sponsor shall deem reasonable under the circumstances; and (ii) extend the Sweepstakes Period, by providing notice on the Sweepstakes Website, located at https://www.stonyfield.com/thanksdad, if Sponsor determines, in its sole discretion, that there is an insufficient number of eligible Sweepstakes entries or in the event of unexpected difficulties or other causes beyond Sponsor's control. Announcement of Winner. 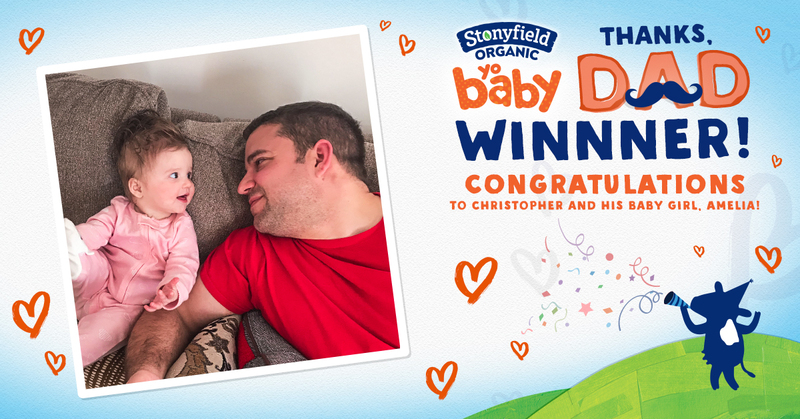 The winner will be announced and posted by Sponsor on the Sweepstakes Website located at https://www.stonyfield.com/thanksdad, following the completion of the Sweepstakes and verification of the winner. The winner may also be announced on www.stonyfield.com and/or Sponsor's Facebook, Twitter and/or Instagram sites currently located at www.facebook.com/stonyfield, www.twitter.com/stonyfield, and/or www.instagram.com/stonyfield. Use of Winner's Name and Likeness. By submitting an entry, each entrant, acknowledges and agrees that, if selected as the winner, Sponsor may post entrant’s first name and state of legal residence and the first name of the child(ren) appearing in the Photo submitted with the winning entry on www.stonyfield.com and/or Sponsor’s Facebook, Twitter and/or Instagram sites currently located at www.facebook.com/stonyfield, www.twitter.com/stonyfield, and/or www.instagram.com/stonyfield. A winner who accepts a prize will be deemed thereby to have granted to Sponsor the right, at any time and from time to time, to print, publish, broadcast and use, worldwide and in any media now known or hereafter developed, including but not limited to, the Internet and world wide web, the winner’s name, portrait, picture, voice, likeness and biographical information as news or information and for advertising and promotional purposes without additional consideration, or right of review or notification, except where prohibited by law, and to have agreed to provide documentation in writing to confirm the foregoing promptly upon request by Sponsor. Release of Liability. By participating in the Sweepstakes, each entrant, for himself/herself and on behalf of the child(ren) appearing in the Photo submitted by entrant in connection with the Sweepstakes agrees that Sponsor, and its parent, subsidiaries and affiliated companies, and their respective successors and assigns, and any and all of their respective officers, directors, shareholders, employees, agents, representatives, licensees, and advertising and promotion agencies (collectively, the "Released Parties"), shall not be liable for any personal injury, death, loss or damage of any kind or any other causes of action or claims related to entrant’s participation in the Sweepstakes, any Sweepstakes-related activity, use of the Photo submitted with the entry, or acceptance or use of the prize awarded, or any portion thereof, and/or based on publicity rights, defamation or invasion of privacy. By participating in the Sweepstakes, each entrant agrees to release and discharge, and hereby releases and discharges, for himself/herself and on behalf of the child(ren) appearing on the Photo, the Released Parties from any liability arising from or related to the Sweepstakes, including without limitation, liability arising from or related to claims for personal injury, death, property damage, or claims based on publicity rights, defamation, or invasion of privacy. Indemnification. Each entrant agrees to indemnify, defend and hold harmless the Released Parties from and against any loss, damage or expense (including court costs and attorneys’ fees) that any or all of them may suffer or incur as a result, directly or indirectly, of, or in conjunction or connection with entrant’s participation in the Sweepstakes, any Sweepstakes-related activity, use of the Photo submitted with an entry, breach of any warranty and representation made by entrant as set forth in these Official Rules, receipt, acceptance, use and/or enjoyment of the prize awarded, or any portion thereof, and/or any breach or alleged breach of any warranty or representation made by entrant in connection with the Sweepstakes. Unlawful Conduct and Disqualification. Sponsor reserves the right, in its sole discretion, to disqualify any entrant who Sponsor determines, in its sole discretion, has (a) tampered with the entry process or the operation of the Sweepstakes or of any web site owned, operated or controlled by Sponsor or its parent, subsidiaries or affiliated companies; (b) was ineligible to participate in the Sweepstakes; (c) submitted more than the allowed number of entries; or (d) otherwise acted in an unlawful manner and/or in violation of these Official Rules. Robotic, automated, programmed, or computer generated entries or mechanical reproductions are prohibited, and any use of such devices or entry methods will cause disqualification. Any attempt by an entrant to deliberately damage any web site or undermine the legitimate operations of the Sweepstakes is a violation of criminal and civil laws. Should such an attempt be made, Sponsor reserves the right to seek damages from any such entrant to the fullest extent permitted by law and to disqualify such entrant from the Sweepstakes. Limitation of Liability and Damages. UNDER NO CIRCUMSTANCES, INCLUDING NEGLIGENCE, SHALL SPONSOR BE LIABLE FOR ANY DIRECT, INCIDENTAL, INDIRECT, SPECIAL OR CONSEQUENTIAL DAMAGES, OR EXEMPLARY OR PUNITIVE DAMAGES, INCLUDING, BUT NOT LIMITED TO LOSS OF PROFITS OR HARM TO BUSINESS OR REPUTATION, ARISING OUT OF ENTRANTS’ PARTICIPATION IN THE SWEEPSTAKES, USE OF ANY PHOTO PROVIDED BY ENTRANTS, POSTING ON OR ACCESS AND/OR DOWNLOAD OF ANY MATERIALS OR INFORMATION FROM ANY WEB SITE OWNED, OPERATED OR CONTROLLED BY SPONSOR OR ITS PARENT, SUBSIDIARIES OR AFFILIATED COMPANIES, OR ACCEPTANCE OR USAGE OF A PRIZE OR ANY PORTION THEREOF, AND INCLUDING WITHOUT LIMITATION DAMAGE TO PROPERTY AND, TO THE MAXIMUM EXTENT PERMITTED BY LAW, DAMAGES FOR BODILY OR PERSONAL INJURY, EVEN IF SPONSOR HAS BEEN ADVISED OF THE POSSIBILITY OF SUCH DAMAGES OR LOSS. ENTRANT AGREES THAT THE AGGREGATE LIABILITY OF SPONSOR ARISING OUT OF ANY KIND OF CLAIM (WHETHER IN CONTRACT, TORT, OR OTHERWISE) SHALL NOT EXCEED $1.00. LIMITATIONS OR EXCLUSIONS OF LIABILITY SUBJECT TO ALL APPLICABLE FEDERAL, STATE AND LOCAL LAWS AND REGULATIONS. Severability. If any one or more provisions of these Official Rules are held to be invalid, illegal or unenforceable by a court of competent jurisdiction, such invalidity, illegality or unenforceability shall not affect the validity, effect or enforcement of any other provision or provisions of these Official Rules. Force Majeure. The failure of Sponsor to comply with any provision of this Official Rules due to an act of God, hurricane, war, terrorism, fire, riot, earthquake, actions of governmental authorities outside the control of Sponsor or other force majeure event shall not be considered a breach of these Official Rules. Governing Law; Jurisdiction; Venue. These Official Rules shall be interpreted in accordance with New Hampshire law without regard to its conflicts of laws provisions. Entrants agree that the state and federal courts located in New Hampshire shall have exclusive jurisdiction over any dispute arising from or relating to these Official Rules, this Sweepstakes or entrants’ participation in this Sweepstakes or any Sweepstakes- related activity, and entrants consent to the personal jurisdiction and venue thereof. All disputes shall be resolved individually, without resort to any form of class action. By entering the Sweepstakes, entrants waive the ability to bring claims in a class action format. Official Rules and Winner's Name. To obtain the name of the Sweepstakes winner (after the conclusion of the Sweepstakes) and/or a copy of the Official Rules, send a self-addressed stamped envelope to: Stonyfield Farm, Inc., 10 Burton Dr., Londonderry, NH 03053, Attn: Thanks, Dad Sweepstakes. Please specify "Winner’s Name" or "Official Rules" in your request.